The energy that drives the earth's climate originates with the sun. 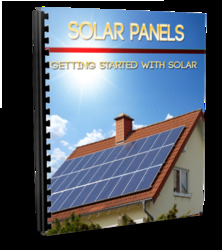 Variability in the output of solar energy occurs at a variety of timescales from interannual to millennial. 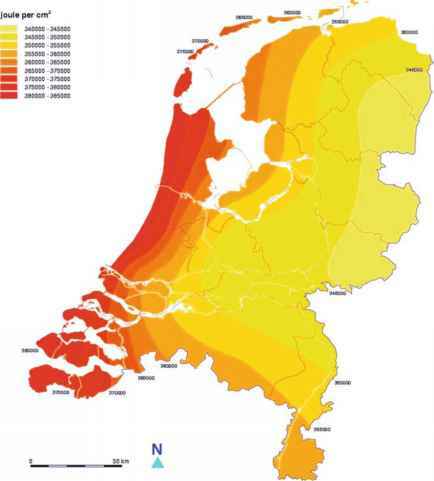 At the timescales investigated here, sunspots are the major mechanism of variation in solar irradiance (Landscheit 1983). During active sun periods (i.e., periods of increased sunspots), solar irradiance increases. Systematic human observations of sunspot cycles have been made for over 300 years, and they indicate an 11-year cycle (Lean et al. 1995). The sunspot cycle causes a variation in solar irradiance of about 0.15% (~2 Wm-2). This modest variability in solar irradiance may have links to climate variability and drought (Eddy 1983), although direct solar influences on interdecadal climate response are controversial (Ruddiman 2001). Climate variability also arises from atmospheric processes internal to the earth's system. These processes are defined by coherent and correlated patterns of atmospheric temperature, pressure, winds, and circulation at characteristic locations across the globe. Although associated with specific locations, these processes ex hibit teleconnections capable of influencing weather and climate patterns across the globe, including in the continental interior of North America. One of the best known and most studied of these atmospheric teleconnection processes is the El Niño-Southern Oscillation (ENSO). ENSO is a pattern of pressure change across the Pacific (the Southern Oscillation), accompanied by a flow of warm water from the equatorial western Pacific Ocean toward South America (El Niño). Presence of the warm equatorial countercurrent off western South America, in conjunction with lower atmospheric pressures, is referred to as the ENSO warm phase. The cold phase occurs when cool currents and increased atmospheric pressures predominate. ENSO events are quantified by several indexes, mostly derived from atmospheric pressure and sea surface temperature (SST) within various regions in the Pacific. ENSO-related climate variability occurs mainly at quasi-quintennial timescales. The NINO1+2 and NINO3 indexes show significant periods at about 3.5 and 7.0 years (Kaplan et al. 1998; Reynolds and Smith 1994; Latif et al. 1998). El Niño events are correlated with temperature and precipitation in the central United States, although the strength of association may depend somewhat on the index used (Philander 1990; Greenland 1999). Sittel (1994) found that warm ENSO events were associated with warmer average temperatures; however, fall and winter were dry during warm events. Cold events did not alter temperature patterns as strongly as did warm events, but they did result in lower spring and fall precipitation. The North Atlantic Oscillation (NAO) also affects climate in the interior of North America. NAO is a low-frequency oscillation in atmospheric mass and, consequently, pressure across the North Atlantic Ocean. In its positive phase, the NAO is characterized by higher subtropical pressure and lower subpolar pressure, strengthening midlatitude westerly winds. In the negative phase, both these pressure features are weakened, and westerly wind speeds decrease. The amplitude and phase of the NAO are highly variable, ranging from interseasonal to interdecadal (van Loon and Rogers 1978; Wallace et al. 1996; Hurrell 1995). The NAO exhibits variability at both interannual and interdecadal timescales. Spectral analysis of the NAO index values show prominent oscillations at about 5 and 9 years (Hurrell 1995). NAO effects are observed during all seasons, accounting for 33% of the variance in winter sea level pressure (Cayan 1992). The NAO is positively correlated with spring and summer temperature and precipitation in the Central Plains (van Loon and Rogers 1978); however, the strength of association is weaker than for other regions of North America. 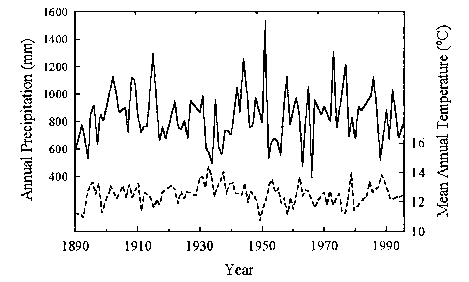 Figure 20.2 Time series of climate variables used in this chapter for the period 1891-1998. Annual precipitation is shown by the solid line and mean annual temperature by the dashed line. temperature in the North American interior. Patterns reverse when NP is positive. The index is also associated with changes in synoptic storm tracks (Rogers and Rohli 1991). The NP is highly negatively correlated with another well-known tele-connection pattern, the Pacific North American (PNA) index (Trenberth 1990).